Welcome to April! Hopefully you haven't been fooled too many times today! I normally love April Fool's day, especially for cute, harmless little pranks and goofy fun. 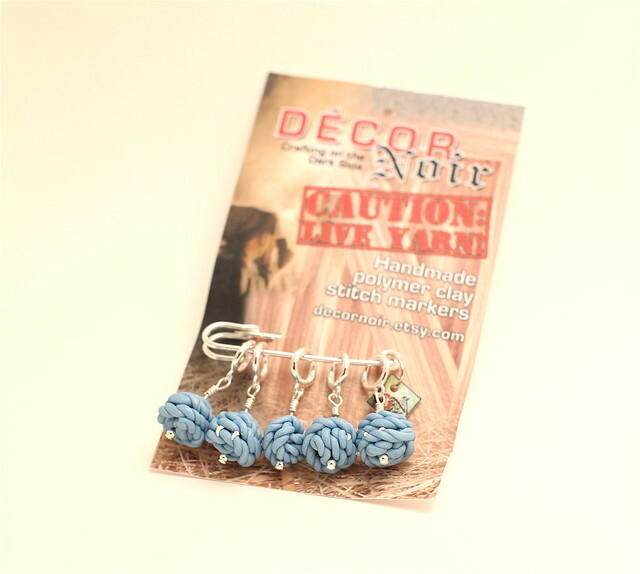 Vampire yarn ball stitch markers from Decor Noir? Why, yes, fang you very much! Decor Noir is an awesome little shop with all sorts of delightfully dark knit-related supplies. I love the concept on so many levels: first, her stuff is witty and cute. Secondly, it defies stereotypes about knitting and knitters. Also, the shop's stuff is just INCREDIBLY well-made. I've seen quite a few polymer clay markers, but these are done with a level of skill and execution that is beyond others. For this giveaway, you get the pictured blue fang markers, courtesy of Decor Noir. To enter, "Like" Decor Noir on Facebook! If you don't have Facebook, you're more than welcome to fave an item in her Etsy shop. The come on back here and let me know what you did! I'll choose my winner on the last day of the month! What a great giveaway! 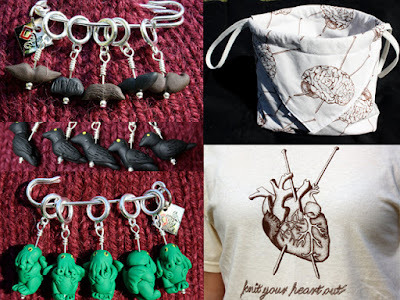 I have faved Decor Noir on FB, and also fave two of their items on etsy- the "knit your heart out" t-shirt and the Count Baacula knitting bag. Such a great little shop, thanks for the feature!! I faved the Cthulhu stitch markers. I keep seeing her stuff! I crave it! I favourited the moustache stitck markers! 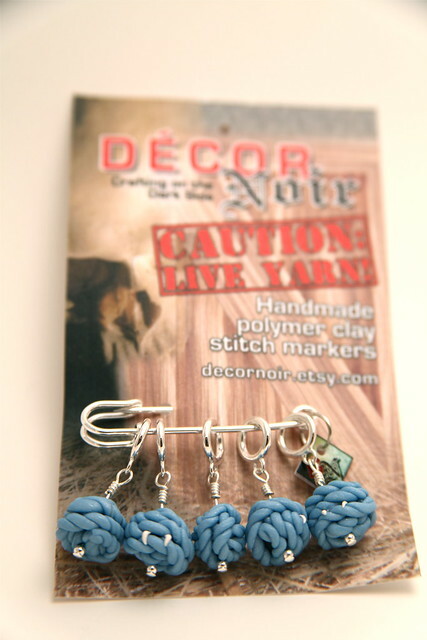 I favorited the Mummy stitch markers on Etsy. Love those! I love her store! I had to favorite a few ( no FB) organic, bloody eyeball, etc! Love the fangs.. I liked on FB. I keep telling myself that I don't need more stitch markers, but I just faved cthulhu, mustaches, and gas masks. I already 'liked' on FB. I just faved the Count Baacula Drawsting Origami Knitting Project Bag. Marked you as a favorite on etsy, and posted a link to your mustache markers on the Cleveland Knits West Ravelry page. One of the knitters in that group has developed a thing for mustaches!! I favorited the Black Bird stitch markers and the Knit for Brains project bag. Everything is so awesome! I favourited her brain slug stitch markers - great fun! I liked her on FB. I love the knit your heart out shirt! I "liked" the stitch markers with fangs on FB. 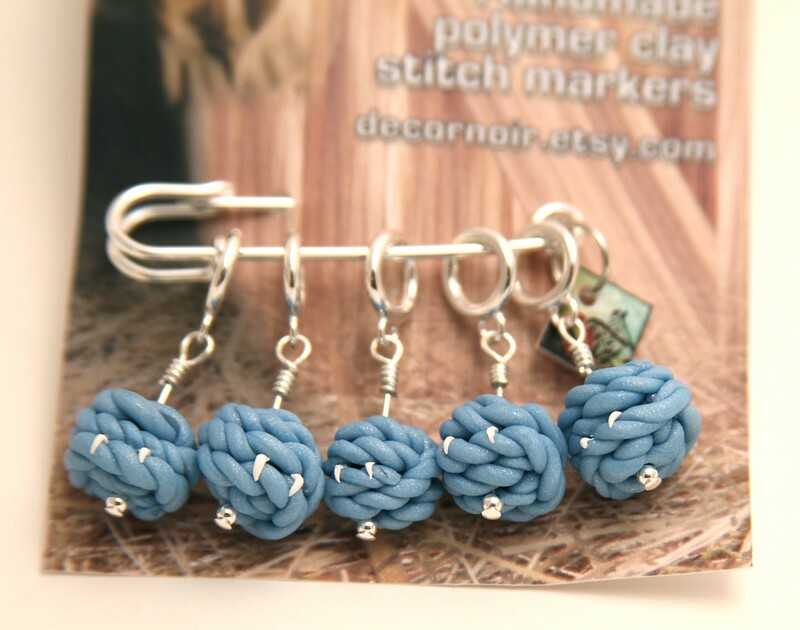 SHE HAS FSM STITCH MARKERS! Totally faved on FB and faved those markers on Etsy. Will most likely be going back to buy those babies. How did I miss this post? I liked their FB page and added the Hollywood Monsters and Cthulhu stitch markers to my faves on Etsy. I just liked ALL THE THINGS, because whoa - awesomeness!